Citation: Batal MA, Alyamani K. Spectroscopic Study of FTO/CdSe (MPA)/ZnO Artificial Atoms Emitting White Color. Nano Sci Nano Technol. 2017;11(1):114. Light emitting diode prepared from FTO/CdSe (MPA)/ZnO artificial atom multi layers was prepared using spin coating method at room temperature. Absorption spectra reveal wide range of absorption wavelength (350-550) nm, PL spectra shows four clear peaks distribution in UV and visible spectra, Gaussian profile analysis confirm theoretical electronic transition in structure FTO/CdSe (MPA)/ZnO. Intensity of blue color was higher than green and red color due to quantum confinement effect in the structure of LED, experimental electronic transitions were corresponding to theoretical transitions. Polymer-semiconductor Nano composites generate a new field for the development of advanced materials in science and technology specially industry LEDs which has been demonstrated and is attracting increasing interest in an effort to obtain devices that combine the advantages of both systems for monochromatic visible and near infrared emission as well as for creating white light. Despite recent progress, device efficiencies of QD-LEDs still lag behind the more common organic and polymer LEDs . Quantum Dots (Artificial atoms)-based light emitting diodes (QLEDs) have attracted intense research and commercialization efforts over the last decade . In fact, QLEDs have several advantages compared to organic LEDs (OLEDs). These are as follows: (i) FWHM of the emission peak from quantum Dots is only 20 nm to 30 nm, Inorganic materials usually show better thermal stability than organic materials. Under operating at high brightness as well and/or high current, Joule heat is one of the predominant problems for device degradation. With better thermal stability, inorganic materials based devices expected to exhibit longer lifetimes . (iii) The display color of OLEDs generally changes with time due to the different lifetime of the red, green and blue pixels . However, one can obtain all of three premium colors from artificial atoms with the same composition changing the particle size (due to the quantum confinement effect). The same chemical composition should exhibit similar degradation with time. To fabricate Quantum LEDs emission white color using artificial atoms of CdSe embedded in metapraponic acid (MPA).Multi quantum layers has fabricated to design first type of quantum confinement effect between layers of LED. Quantum confinement effect studied through optical study spectroscopy, absorption and PL spectra using Gaussian analysis, and electrical spectra of tunneling spectra and impedance spectra. Microscopic Slides, K2Cr2O7 for cleaning glass slides, HF (fluoric acid), SnCl2.2H2O, Ethylenglycol, metapraponic acid (MPA), CuCl2, KI, Se powder, Cd(CH3COO)2.4H2O, Hydrazine, deionized water. Microscopic slices were cleaned using K2Cr2O7, then it’s emerge diluted fluoric acid (HF) for 10 minutes for scratch external surface of Microscopic slices. After that Microscopic slice were heated put on electrical oven to 500°C. SnCl2.2H2O (5 gr) solved in 20 ml of Ethylenglycol and sprayed on Microscopic slices several times each 5 min . The deposited resistance film SnO2 measured and its (13-40) Ω.
ZnO Colloidal solution was prepared by solve 0.1 mol from (CH3COO)2Zn.2H2O in 100 ml of ethanol with heated to . Artificial atoms of CdSe were prepared by chemical solutions method. Cadmium Citrate (Cd (CH3COO)2.4H2O) used as the cadmium source and sodium selenosulfate (Na2SeSO3) was chosen as the selenium source. Cadmium Citrate (22.8 gr) was solved in 100 ml of deionized water called solution (A). Sodium selenosulfate which was prepared by solving Na2SO3 (12.6 gr) in 100 ml of deionized water, adding selenium powder (7.96 gr) to Na2SO3 solution and refluxing at 70°C for 3 hours, red wine solution will appear called solution (B). Solution (A) (20 ml) was added to solution (B) (5 ml), ethylene glycol (5 ml), hydrazine hydrate (5 ml) were added to previous. CdSe colloidal Solution was adjusted 10 by adding 1 ml NaOH solution . Using spin coating method for prepared FTO/ZnO/CdSe (artificial atoms)/FTO, as it shown in Figure 1. Figure 1: (a) Energy diagram of quantum well confinement of structure (b) box layer diagram of FTO/CdSe (MPA)/MPA/ZnO. Absorption spectra of FTO/CdSe (MPA)/ZnO artificial atoms carried out using spectrophotometer (UV Win5 V5.2.0) at room temperature. Figure 2 shows absorption spectrum it reveals six clear peaks in wavelength range (350 nm to 550 nm). Peak numbers from (1-4) belong to CdSe (MPA) core shell artificial atoms . The five peak at wavelength 400 nm related to ZnO layer, whereas the six peak belong to FTO layer (Table 1). Table 1. Absorption peaks wavelength and their energies in eV for system FTO/CdSe (MPA)/ZnO. 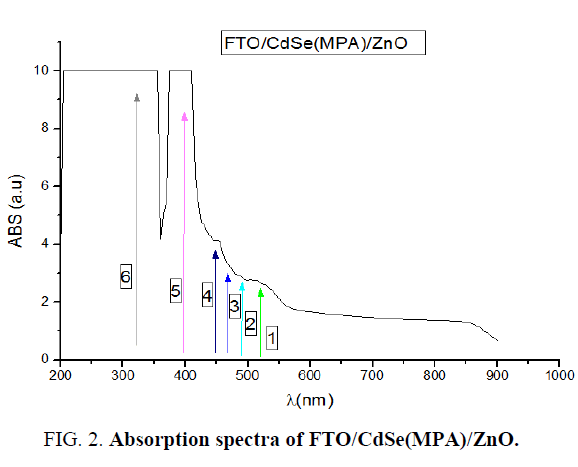 Figure 2: Absorption spectra of FTO/CdSe(MPA)/ZnO. PL spectra carried out using spectrophotometer Hatchi-L 250 using wavelength excitation 280 nm. Figure 2 shows PL spectra of FTO/ZnO/CdSe(MPA) core shell, where as there are four clear peaks concentrated at wavelengths (350-400-500-550 nm) corresponding color ultra violet, blue, yellow and red, which means that FTO/ZnO/CdSe(MPA) emission white color depending on theory of mixing colors. To insure electronic transitions in FTO/ZnO/CdSe (MPA) artificial atoms, which found in structure system, theoretical energy of electronic transitions as in Figure 3 and 4. By using Gaussian, profile for all theoretical energies transitions of FTO/ZnO/CdSe (MPA) artificial atoms (Table 2). 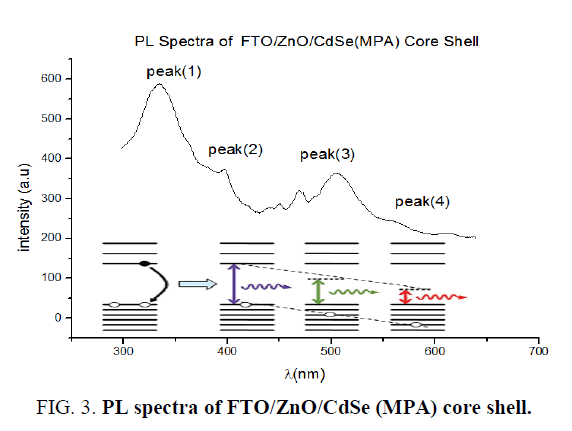 Figure 3: PL spectra of FTO/ZnO/CdSe (MPA) core shell. 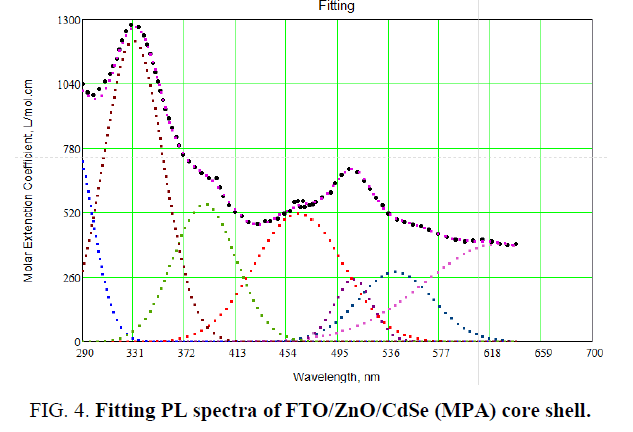 Figure 4: Fitting PL spectra of FTO/ZnO/CdSe (MPA) core shell. Table 2. Comparison of sugarcane genotypes by their propagation responses using pooled values. Light emitting diode emit white color (due to quantum size effect) consist of multi quantum layers, CdSe (MPA)core shell was active layer sandwich between two layers FTO and ZnO. Energy of Electronic transitions in the PL and Absorption spectra were corresponding theoretical transition. Intensity of blue color was higher than green and red color due to quantum confinement effect in the matrix. Wide PL peak was corresponding different size of artificial atoms. I am so grateful to team members of research laboratory 7 at physics department for their effort (Drs. Wafaa hag esmaeil, Faouaz Kayali and Fatima sourroji). Meaning B, Pfeiffer M, Nollau A, et al. Controlled p-type doping of polycrystalline and amorphous organic layers: Self-consistent description of conductivity and ?eld-e?ect mobility by a microscopic percolation model. Phys Rev. 2001;B64:195208. Sullivan SC. Optoelectronics: Quantum dot developments. Nat Photonics. 2009;3:315-6. Muller CD, Falcou A, Reckefuss, et al. Multi-color organic light emitting displays by solution processing. Nature. 2003: 421:829-33. Caruge JM, Halpert JE, Wood V, et al. Colloidal quantum-dot light emitting diodes with metal-oxide charge transport layers. Nat Photonics. 2008;2:247-50. Batal MA, Al-yamani K. Optical properties of colloidal CdSe/CdS/Zns/PVPQDs core/shells embedded in fatty acid medium. NSNTAIJ. 2015: 9(1): 022-8. Zhong LW. Zinc Oxide Nanostructures: Growth, properties and applications. J Phys Condens Matter. 2004;16:R829-58. Gupta P, Ramrakhiani M. Influence of the particle size on the optical properties of CdSe nanoparticles. Open Nanosci J. 2009;3:15-9. Woggon U. Optical properties of semiconductor quantum dots. Springer. Berlin.1997.